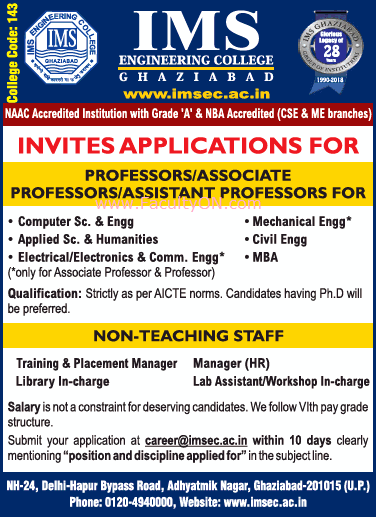 IMS Engineering College, Ghaziabad has advertised for recruitment of Professor / Associate Professor / Assistant Professor jobs vacancies. Interested and eligible job aspirants are requested to apply within 10 days from 05th December 2018. Check out further more details below. About College : Ever since its commencement the group has promoted entrepreneurship, new ideas and technological innovations among its students to make them the future leaders of the professional world. What started as a nascent dream in the year 1990 became a distinct reality within two decades of its foundation, equipped with state of the art infrastructure and modern technology. Imparting education in the areas of Management Sciences, Tourism, Information Technology and Bio-Sciences; IMS Ghaziabad has attained a matchless and a decidedly reputable place amongst the best professional education institutions in India over the past 26 years.